Socially and environmentally committed clothes. That’s the promise of Toad&Co, one of TrailblazerGirl’s favorite companies, as is evident from the many glowing reviews we’ve done featuring their sustainable fashion. They’ve really taken their promise to heart with 100% sustainability with the fabrics they’ve chosen for this year’s entire spring collection! Wow, very impressive! And so is the new Susurro Duo Short Sleeve Tee. It’s as soft as silk, with a smooth, cool feel. The neckline hangs beautifully, as do the cute, little cap sleeves. Dress it up or dress it down, the Susurro will have your looking stylish at work and on the trails. It has a slightly longer length that is ideal with leggings, and the stretch in the fabric makes for a slim, not boxy fit. The material is light which will be perfect for warmer weather or spring layering, and smartly the front is double layered, providing for plenty of coverage. Choose from 5 different colors. 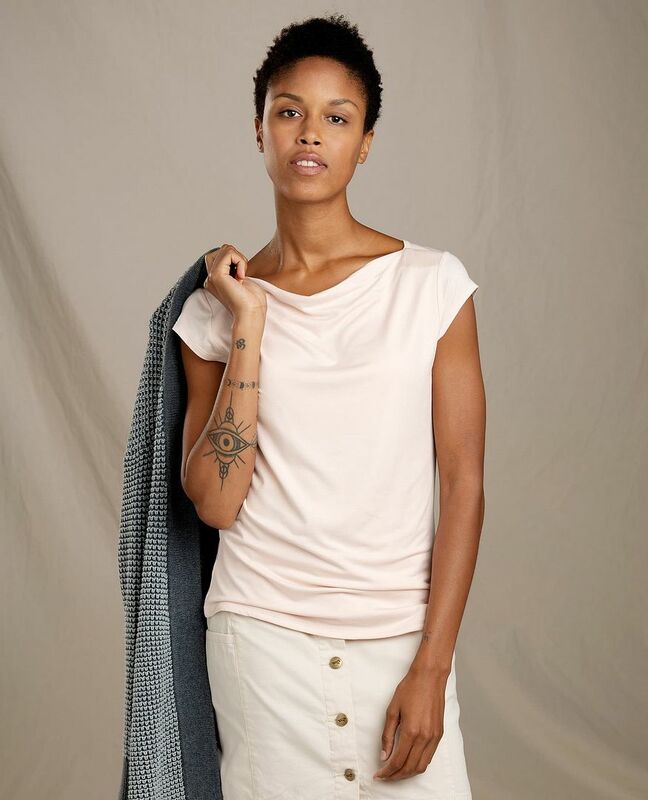 We’re big fans of the clothes at Toad&Co and their dedication to the environment as well as making a difference in the lives of others through their support of people with disabilities, and we know that you will be too!